A key challenge in low-thrust trajectory design is generating preliminary solutions that simultaneously detail the evolution of the spacecraft position and velocity vectors, as well as the thrust history. 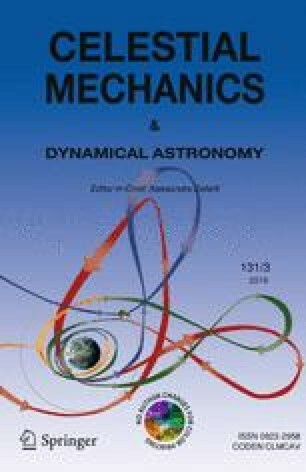 To address this difficulty, dynamical structures within a combined low-thrust circular restricted 3-body problem (CR3BP-LT) are explored as candidate solutions to seed initial low-thrust trajectory designs. Furthermore, insights from dynamical systems theory are leveraged to inform the design process. In the combined model, the addition of a low-thrust force modifies the locations and stability of the equilibria, resulting in flow configurations that differ from the natural behavior in the CR3BP. Families of periodic solutions in the vicinity of the equilibria supply novel geometries that may be employed in initial designs. Additionally, the application of simplifying assumptions yields a conservative, autonomous system with properties that supply useful insights. “Forbidden regions” at fixed energy levels bound low-thrust motion in such a simplified system, and analytical equations are available to guide the navigation through energy space. Periodic orbits and their associated manifolds also possess useful properties and act similarly to separatrices in the simplified regime. These structures and insights are employed to design transit and capture trajectories in the Earth-Moon CR3BP-LT. This work is supported by a NASA Space Technology Research Fellowship, NASA Grant NNX16AM40H. This research is supported by a NASA Space Technology Research Fellowship, NASA Grant NNX16AM40H. Portions of this work were completed at the NASA Goddard Space Flight Center, supported by the aforementioned grant. The authors are grateful to the reviewers for providing thorough and insightful feedback on this paper; it has certainly been improved as a result. Additionally, thanks to the Purdue University School of Aeronautics and Astronautics for their facilities and support, including access to the Rune and Barbara Eliasen Visualization Laboratory. Finally, many thanks to the JPL Mission Design and Navigation branch, the Purdue Multi-Body Dynamics Research Group, and Dr. Dan Grebow for interesting discussions and ideas.